This apparatus makes Coulomb’s Law simple for educators and students. 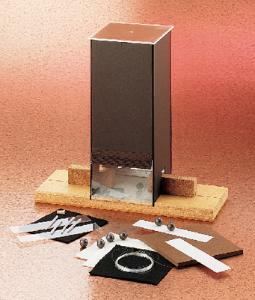 It consists of a rigid fiberboard housing with a hinged-glass front window mounted on a rugged wooden base. The base has a groove to guide the wooden block in and out of the housing. The bottom of the housing contains a grid, and an adjustable mirror and ruler are mounted on the back wall. Ordering information: This apparatus includes both a Masonite and a Lucite top, a guide block, acetate and vinyl strips, graphite-coated spheres, cotton and wool cloth squares, monofilament, and polyethylene insulators.